Complete a buyer registration form in order to bid on equipment. You must provide valid photo identification such as: Driver’s License, Passport, Photo ID, etc. Bank letter of guarantee addressed to Lloyd Meekins & Sons Auction Company (view a sample letter). Wire transfers please call Debra Meekins at (800) 499-6560. Follow the same registration procedure as if you were bidding in person. You must fax our office a valid identification. (910) 738-1389. List the particular items you are interested in placing a bid on. 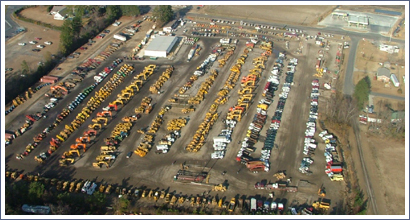 There are two main principles that Lloyd Meekins and Sons Auction Company believes in when it comes to dealing with our customers:: Loyalty and Dedication. We have been in the auction business for over 35 years and we understand that to have success as a business, you must listen to your customer. Our auction company wants to know you for your business. More importantly, we want to know you as a person. & Sons Auction Company today. (800) 499-6560 or e-mail info@meekinsauction.com.